We all lead busy lives. No one is questioning that. If we're honest, THAT is what has contributed to the convenience food market more than anything. I'm no different. But, things are changing. We're all becoming more aware of what we are putting in our bodies, and many of us are returning to the art of cooking with whole foods. The good thing is it doesn't have to be time consuming. Take my Healthy Roasted Chicken, Brussel Sprouts, and Sweet Potato Dinner with a Mustard Pan Sauce for example. To start things off you will need to preheat your oven to 450 degrees. But let me share a great little cooks tip with you for roasting vegetables. Line your Baking Sheet (the Nordic Ware Aluminum Commercial Baker's Half Sheet is my fav) with aluminum foil. Then place it into the oven while it preheats. The sheet pan will get nice and hot and this will lend itself to some beautiful caramelization on your veggies. While the oven is preheating you can place the brussel sprouts and sweet potatoes into a bowl. Drizzle 2-3 Tbsp of extra virgin olive oil over them. And 1 tsp of dried thyme. Once the oven is preheated to 450, remove the HOT baking sheet and drizzle with a little extra virgin olive oil. Place your vegetables, in a single layer, over the baking sheet. Then place in the oven for 5 minutes. Now place an OVEN-SAFE pan over medium/high heat and add a little extra virgin olive oil. Place the pan into the oven, with the veggies, for 10 minutes. After 10 minutes remove everything from the oven and place the chicken on the baking sheet. Cover with foil and let rest while you make your pan sauce. Now it's time for that sauce! To make your pan sauce you will place the skillet you made your chicken in over medium high heat. Now add the Dijon Mustard. Next, add the other tsp of thyme and a dash of stevia (I forgot to take a picture of that step). Whisk everything together and let it reduce by half. That means that half of the amount of liquid you started with will remain in the pan. Once the sauce has reduced and thickened, add the butter to the sauce and whisk it in till smooth. This will give your sauce a gorgeous, silky affect. Taste for seasoning. I added a little pepper. Then, you are ready to plate! Simply place your chicken and vegetables on a place and spoon the pan sauce over them. Look at that! 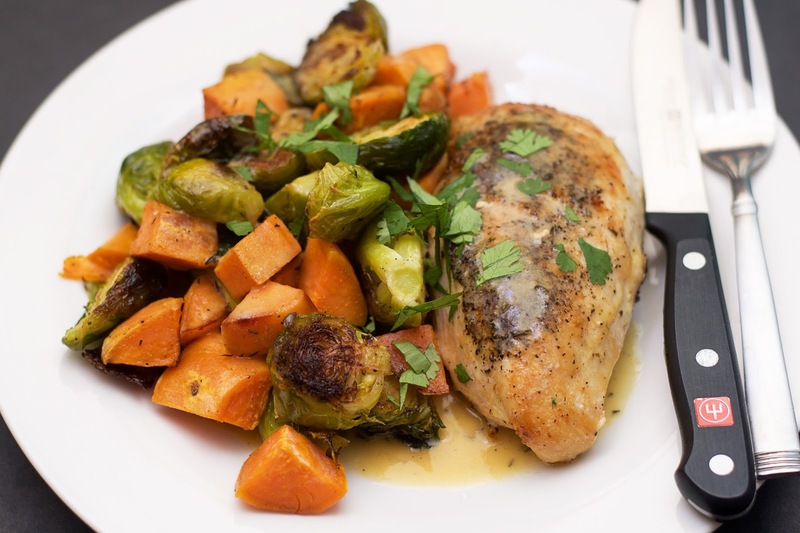 This Healthy Oven Roasted Chicken, Brussel Sprouts, and Sweet Potato Dinner with a Mustard Pan Sauce is stunning on the table, and the best part is that this gorgeous meal took only 20 minutes to make. 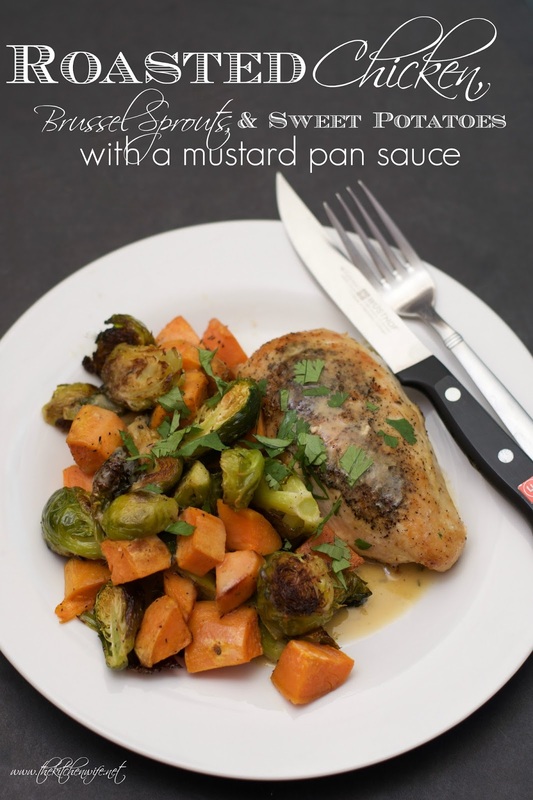 And can we talk about that mustard pan sauce!?! It is EVERYTHING and hold up YOU JUST MADE A PAN SAUCE! #fancy So see, healthy, whole food, cooking doesn't have to be time consuming. So get in the kitchen and give this mouthwatering meal a try TONIGHT! Place the brussel sprouts and sweet potatoes into a bowl. Drizzle with extra virgin olive oil, salt, pepper, and thyme. Toss and place on a baking sheet. Place the baking sheet into the oven for 5 minutes. Place a skillet over medium/high heat and add a little extra virgin olive oil. Brown the chicken, in the pan, on one side, then turn over and place in the oven with the vegetables for 10 minutes. After 10 minutes remove the vegetables and chicken from the oven. Remove the chicken from the pan and place on the baking sheet. Cover with foil and let rest while you make the pan sauce. Pour in the chicken stock, apple cider vinegar, dijon mustard, and thyme into the pan and whisk together until smooth. Let the sauce reduce by half. Place the chicken and vegetables onto the plate and spoon the sauce over everything. * COOK'S TIP: Line the baking sheet with foil and place in the oven while it is preheating. This will help the vegetables caramelize. ** PAN WILL BE HOT. DO NOT GRAB WITH BARE HAND!